On June 21, Make Music New York hits the streets, a day-long extravaganza of free music events in public spaces in all five boroughs of the city. Among the offerings this year are a New Orleans-style Second Line parade in Manhattan, interactive music in the Meatpacking District, and Take Your Musician to School Day outside public schools. 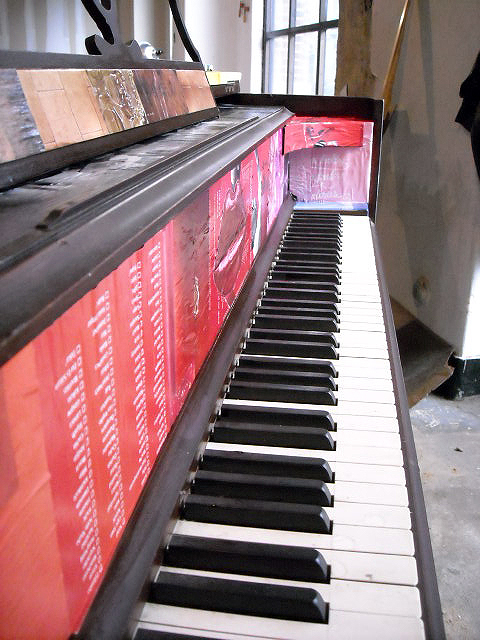 I was particularly intrigued by “Play Me, I’m Yours,” a public art installation of 60 pianos conceived by artist Luke Jerram, set outside for anyone to play. 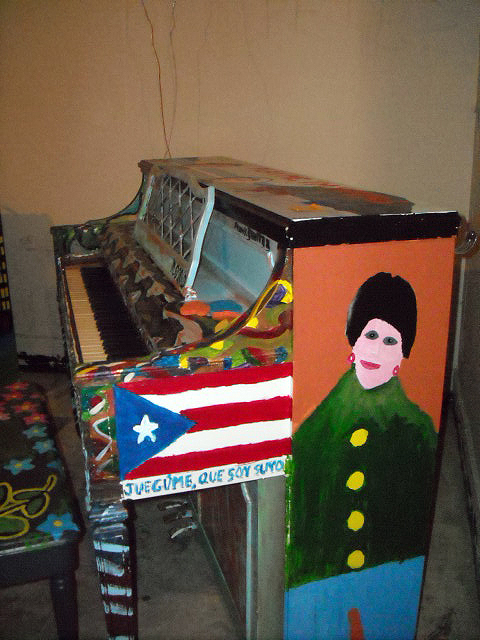 Roughly analogous to the CowParade exhibition in 2000 or Christo’s Gates in Central Park in 2005, the pianos will be decorated and set up in places like the Grand Concourse, Brooklyn Bridge Park, Bryant Park, Jackson Heights Post Office, and the Staten Island Ferry Terminal. 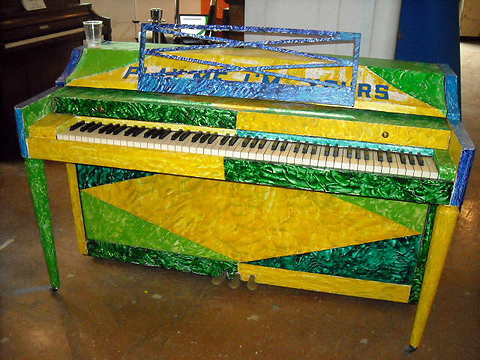 But unlike cow statues or giant swaths of saffron fabric, the pianos are there to be played. They go up on June 21 and remain in place until July 5, when they will be donated to area schools and hospitals. “Play Me, I’m Yours” was organized by the New York-based charitable organization Sing for Hope. Last week I spoke to Emily Walsh, Sing for Hope’s director of operations, about the logistics behind getting 60 pianos in place—and keeping them there safely. (Interview excerpts below.) 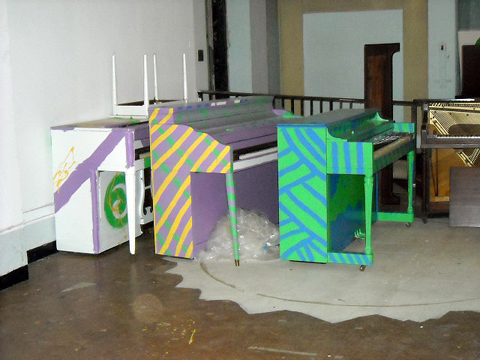 In the weeks leading up to June 21, the pianos have been in storage at a SoHo warehouse (photos below). How did “Play Me, I’m Yours” first come about? Emily Walsh: We initially hoped to do “Play Me, I’m Yours” this August. When we met with the City of New York in January, they thought it would be a great project, but said why don’t you do it in June, to coincide with Make Music New York, instead of August? That definitely threw us into high gear! Sing for Hope had one employee last fall—we’ve grown to five in the past couple of months. The city has been assisting us with the permitting process. 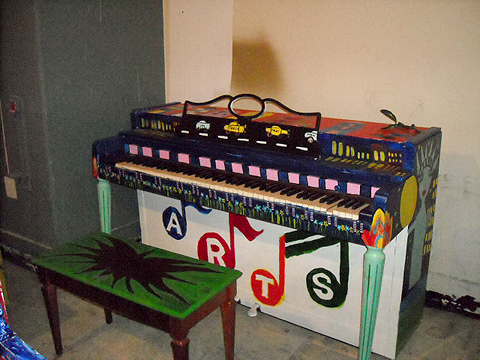 About half the pianos are going into parks, and so we’ve been accepted as a special art project for the Parks Department. We’ve been meeting with all the parks managers, doing site visits, taking photos, talking to them about how each piano will be secured. The pianos themselves will be wired with metal cablings to two 90-pound cinderblocks, which will sit behind them. For those pianos in locations where they can be affixed to a permanent object, we’re going that route, but for the majority of them they had to be self-standing, so we’ve come up with the whole cinder block idea. Each of the pianos is going to have a piano buddy who is responsible for general maintenance of the piano. They open the piano at 9 a.m. every day, and they close it at 10 p.m.; they also check the weather forecast, and if it’s supposed to be pouring rain all day, instead of opening the piano, they’ll go and cover it with a plastic tarp, which is attached to the back, rolled up in a little bundle that can be unraveled. “Play Me, I’m Yours” has been done in London before. Did any of the lessons about logistics come from that installation? Emily Walsh: The piano buddies and the tarp are from designs that the London people set up. The cinder block thing was our own creation, because we had much stronger regulations regarding how we’re fixing these pianos. These are regulations from the City of New York? Emily Walsh: Yes. There’s a bureau of the city that controls any fixed object—like lampposts or fences. And they’re very particular about what they will allow—virtually nothing—to be affixed to it. So we had to come up with a system where each piano that can be fairly stable and secure by itself. Emily Walsh: The project here in New York—60 pianos—is double the size of the London installation. Our budget is exponentially greater. We had huge insurance requirements. We’ve had piano movers, and the states are all unionized, and our budget for this project is $220,000. In London, they worked off of a $30,000 budget (£20,000). Where do the pianos come from? Emily Walsh: We have been assisted by a number of people who’ve been donating their time to make this happen. The most important of these is Fred Patella, who does concert piano services. He’s the one who has sourced all these pianos, and they’ve been coming from warehouses from New Jersey to Long Island, New York. We’ve had some individual donations of pianos, but probably about 90 percent of the pianos have come in bulk from warehouses. These are pianos that have sat there for years; no-one has used them, no-one has been able to sell them, and their average value is about $100 to $200. Fred has amassed them all in a warehouse based in Tribeca which has been donated to us, about 7,000 square feet of ground floor of the AT&T building. They’re there right now. 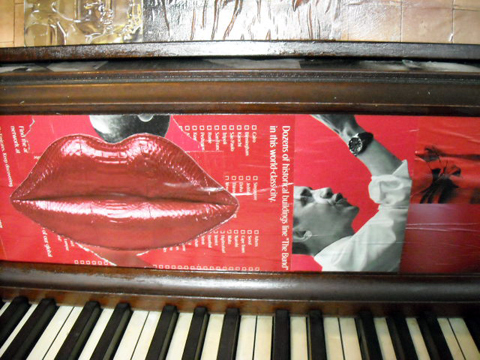 Fred has been working 10 hours a day in the space, refurbishing the pianos, making sure all the keys work, that all of the parts are in there, and also coordinating with the piano movers who we’ve hired to bring the pianos in and who will also be putting all the pianos out on the street. Is this like the Macy’s Thanksgiving Day parade, where the pianos must be readied for the public by the exact same time on June 21? Emily Walsh: The city’s original idea was to install them all overnight on June 20, which just wasn’t feasible. We are going to do three days of installation, starting on Friday the 18th. The pianos will all be locked. The keyboards have padlocks on them, and they’ll be locked until Monday. What will the pianos look like? 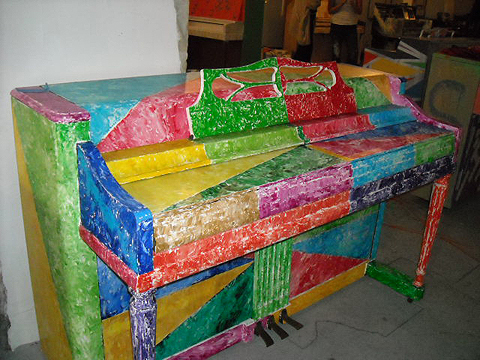 Emily Walsh: We do have a couple of fairly well-known artists painting five of the pianos, but of the most part the pianos are just going to be painted by kids from our program, by Sing for Hope friends and staff—definitely not works of art, but hopefully pleasant to look at. The two artists who are working on pianos, which we’re also planning on auctioning after the project, are Sophie Matisse—she’s actually the great-granddaughter of Henri Matisse, who is painting all four of the pianos that are going to Lincoln Center. 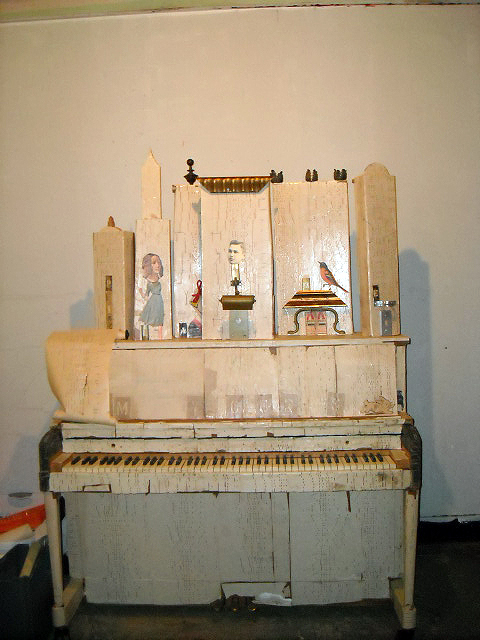 And another artist, the Italian painter Ruggero Vanni, has created this amazing sculpture that fits around the piano, which is going to Chelsea Market. That’s the only indoor location. 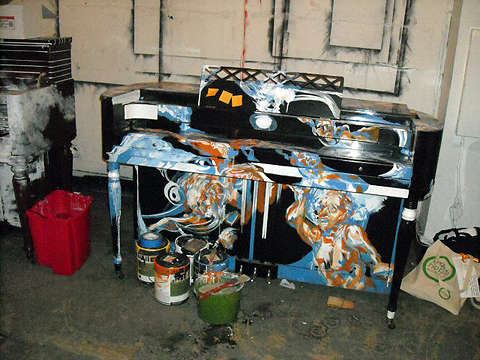 The pianos will be lacquered so they will be completely waterproof. The four pianos that are going to Lincoln Center are going to be at the four corners of the plaza; there are two at the entrance, and then one in Damrosch Park, and one in Hearst Plaza, by the Henry Moore sculpture. 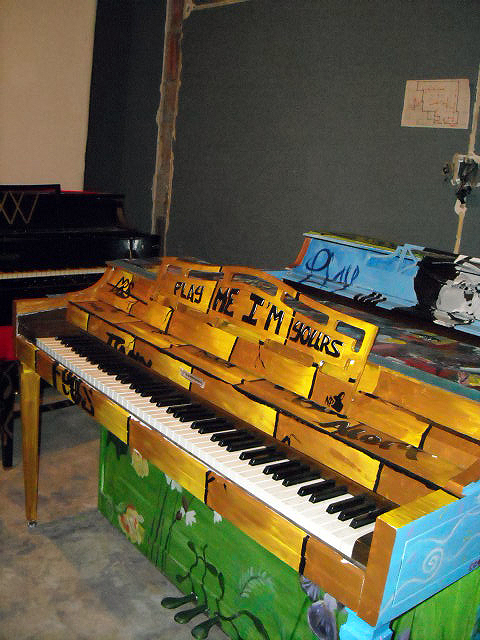 After “Play Me, I’m Yours,” where do the pianos go? Emily Walsh: All the pianos are being donated to schools and hospitals in the New York City area. Sing for Hope’s programming during the year—we work with about 2,000 public school children, 1,500 hospital patients, and we are taking the pianos to the schools that we work with, the hospitals we serve. Are there any sort of scheduled music events involving the pianos? Emily Walsh: On June 21, we’ve given our pianos over to Make Music New York. Events will be scheduled all day. Other than that, we really are only scheduling three other days with the pianos, with maybe a few pop-up events as we find out about artists’ availability. We’re doing one event the evening of June 22 in the meatpacking district, one event the evening of June 26—we haven’t decided on a location for that, but probably Central Park or Fort Greene Park or the Gantry State Park Plaza. And the closing concerts for the event will be on July 5 at the Lincoln Center pianos, from 4 to 6 p.m. Other than that, we’ve pretty much leaving it open to anybody to use their creativity, rather than trying to schedule too much ourselves. What exactly is Sing for Hope, anyway? Is there an easy way to explain what Sing For Hope’s phrases about its nonprofit mission—“arts accessibility” and “artist activism in action”—mean? Emily Walsh: We were founded in 2005 by two professional opera singers, Camille Zamora and Monica Yunus. They are both working professionals in the opera world. They established Sing for Hope as a resource for volunteerism of professional artists. So really it was a volunteer-run, volunteer-driven organization. What we’ve found as sort of our easy catchphrase, is that we’re an Artist Peace Corps. We like to get cross the idea of artist volunteerism, which I think has been helped by this whole idea of Barack Obama’s call to action for volunteers. We have a number of different programs, but with each one it’s easy to just say we’re a roster of artists who volunteer. SundayArts is made possible in part by First Republic Bank and by the Rubin Museum of Art. Funding for SundayArts is also made possible by Rosalind P. Walter, The Paul and Irma Milstein Foundation, The Philip & Janice Levin Foundation, Elise Jaffe and Jeffrey Brown, Jody and John Arnhold, and The Lemberg Foundation. This program is supported, in part, by public funds from the New York City Department of Cultural Affairs in partnership with the City Council. Additional funding provided by members of THIRTEEN.